Most Australian and US viewers will be completely unaware that polls have consistently shown the majority of Syrians supporting their government and opposing armed opposition attacks. British journalist Jonathan Steele wrote in 2012, “Most Syrians back President Assad but you’d never know from Western media. In 2013, a NATO study concluded that Assad was winning the battle for Syrian hearts and minds. In light of this it seems fair to ask: Why are none of these voices included in a documentary about Syria? Why were there no voices from members of the Syrian American Forum or Arab Americans for Syria or from Syrians who actually live in Syria and experience the conflict first hand? Read whole article inside. This article originally entitled: PBS Frontline Fails the Public with “Obama at War”: A Case Study in Distortion and Bias on Syria, by Rick Sterling and first published on June 4th, 2015 at Dissident Voice. Frontline is an influential television program which examines important foreign and domestic issues. The shows tend to be technically well done – combining concise writing with compelling video. Many North Americans watch and have their beliefs shaped by Frontline documentaries. * Where is the conflict headed? Where is US policy headed? The video is online here. The approximate time stamp of some key moments in the video are noted in text below. * It is a violation of international law to provide weapons to a non-state actor trying to overthrow a sovereign state. * The overthrow of the Libyan government led to chaos and increased sectarianism and violence. * There might not be any easy solutions; escalating US involvement as demanded by the “Syrian opposition” and interventionists might actually make things worse. In addition, the program shows the inner workings and debate process in the Obama administration. That said, following are some key problems with the documentary. Three “Syrian Opposition” members (Ouabi Shahbandar, Murhaf Jouejati, and Amr al Azm) appear 12 times through the documentary, using about 7% of the total time. In reality all of the three are U.S. Citizens; none of them has lived in Syria for many years or decades. Ouabi Shahbandar is the “Syrian Opposition” member given prominent attention in the video. He came to the US at age 8. At Arizona State University in 2003 he was a young Republican neoconservative on the rampage, strongly supporting GW Bush and the invasion of Iraq, denouncing war protesters as “terrorists” and allying with far right figures such as David Horowitz. In the past decade he has worked for the US Dept of Defense. Murhaf Jouejati teaches at the National Defense University (US Dept of Defense). A third voice is from Amr Al Azm who is leader of the US funded “Day After Project” intended to plan for development after regime change in Damascus. In short, all three “Syrian Opposition” voices are aligned and committed to US not Syrian national interests. In light of this it seems fair to ask: Why are none of these voices included in a documentary about Syria? Why were there no voices from members of the Syrian American Forum or Arab Americans for Syria or from Syrians who actually live in Syria and experience the conflict first hand? At (2:30) “Syrian opposition” member Murhaf Jouejati claims the Syrian opposition has universal goals and is not sectarian. In contrast, at (3:35) Washington Post journalist David Ignatius describes the uprising as a “Sunni revolution”. How can it be a “Sunni revolution” and non-sectarian at the same time? In reality, both portrayals are distortions. The Syrian conflict has been often characterized in Western media as “an Alawi regime dictatorship dominating the Sunni majority population.” Although repeated countless times, it is essentially untrue. For example, the powerful Syrian Defense and Information Ministries are both led by Sunni Muslims; the Syrian Army is majority Sunni; the economy is dominated by Sunni businessmen. In reality, Syria is a mix of many religions and the government is predominately nationalist and secular, not religious. The opposition is driven by sectarian Wahabi ideology but that does not represent Sunni Islam any more than Zionist supremacism represents Judaism or right wing Christian fundamentalists represent Christianity. U.S. Ambassador Robert Ford is ever-present in the documentary. He appears 15 separate times and his perspective uses almost 10% of the entire video. In the opening scenes, Ford talks about going to support a protest march in Hama. He says “We were not backing any particular set of demands that the protesters were putting forward; we were simply supporting their right to demonstrate peacefully.” This is a nice platitude for those who believe in the tooth fairy, but how about the real world? The U.S. has also taken part in clandestine operations aimed at Iran and its ally Syria. A by-product of these activities has been the bolstering of Sunni extremist groups that espouse a militant vision of Islam and are hostile to America and sympathetic to Al Qaeda. Robert Ford is very familiar with these “extremist groups” since he was Political Counselor under Ambassador John Negroponte in Baghdad 2004 – 2006 during the time that they were launched. Negroponte is infamous in Latin America where he was US Ambassador to Honduras coordinating the creation of the ‘Contras’ in Nicaragua and death squads in El Salvador and Honduras. Negroponte and Robert Ford implemented the transformation in US strategy in Iraq following the first year of US occupation. Called the “Salvador option” by Newsweek magazine, Robert Ford likely played a pivotal role since he was a top official and fluent in Arabic. But this important background information is missing from the Frontline special. Many civilians here are losing patience with the increasingly violent and unrecognizable opposition — one that is hampered by infighting and a lack of structure, and deeply infiltrated by both foreign fighters and terrorist groups. Internally, events are taking a clear sectarian direction. The Salafist, the Muslim Brotherhood, and AQI are the major force driving the insurgency in Syria. It appears Ford was deliberately downplaying the sectarian reality of the conflict to justify his call for greater US intervention. During the immediate aftermath of, and following the uncertainty caused by, the downfall of the Gaddafi regime, in October 2011 and up until early September 2012, weapons from the former Libya military stockpiles located in Benghazi, Libya were shipped …to Syria. 3,000 tons of weapons dating back to the former Yugoslavia have been sent in 75 planeloads from Zagreb airport to the rebels, largely via Jordan. The kernel of truth here is that despite the huge shipments of weapons to the armed opposition they were still losing. Unwilling to accept this, Saudi Arabia wanted to escalate the shipments and transfers even more. There are many scenes of Syrian victims from “armed opposition” territories and battle zones. Like all wars and conflicts, it is horrible with good and bad people on all sides. However, it is striking that there are no videos or interviews showing the extent of casualties in Syrian government areas. Three quarters of the Syrian population live in areas under Syrian government control and they are also victims of random or targeted attacks. Nor is there any hint about the huge number of Syrian soldiers, police and national defense forces who have been killed. Viewers of “Obama at War” will have no idea that between 80 and 120 thousand Syrian soldiers and civil defenders have been killed in the conflict. Many thousands are victims of those “Sniper” rifles shipped under the watchful eye of the CIA. Skeptical readers are urged to look for themselves at the range of estimates from different sources shown here. Contrary to the mythology, there was a violent faction provoking the conflict from the beginning. What would happen in the USA or Canada if foreign sponsored “rebels” killed tens of thousands of police or military soldiers? Intelligence community was assessing that the rebels were on the ropes. You have the clear proof in the intelligence community that there had been chemical weapon attacks …. There are strong, concrete suspicions …of the use of sarin gas….on the part of the opposition, the rebels, not by the government authorities. If the “rebels” were “on the ropes”, why would the Assad government use chemical weapons and provoke international outcry and possible intervention? On the other hand, the “rebels” had the motive and the means. Syrian insurgents had even been captured with Sarin in Turkey earlier in the year. At (26:45) Frontline says “Then, a sarin gas attack on a rebel held suburb of Damascus…..1400 men, women and children are killed according to what the American intelligence agencies tell the President.” John Kerry accuses the Syrian government of using “the world’s most heinous weapons against the most vulnerable people”. Former co-workers are telling us, categorically, that contrary to the claims of your administration, the most reliable intelligence shows that Bashar al-Assad was NOT responsible for the chemical incident that killed and injured Syrian civilians on August 21, and that British intelligence officials also know this. Instead of dealing with the controversy and contrary evidence, Frontline ignored it and echoes the assertions of interventionists. The situation in Libya is highly relevant to Syria – and recent. Wouldn’t it be a good idea to explore what happened there and the lessons to be learned? At (9:45) there is a passing reference to the chaos in Libya following the overthrow of the Gadaffi government. Earlier at (5:45) NY Times reporter Mark Mazetti says “We had seen what happened in Tunisia, Egypt and Libya … Popular demonstrations would ultimately bring down the regime.” However, that is inaccurate regarding Libya where the government was overthrown by a seven month US/NATO/GULF bombing campaign – not “popular demonstrations”. Considering that the attacks on Libya were presented as necessary to “protect civilians” (as is currently argued for Syria), and the eruption of sectarianism and violence which has followed, and the terrible decline in living standards and security for Libyan civilians …. isn’t this worthy of more than five seconds passing reference? “Obama at War” repeats accusations based on unreliable evidence that the Syrian government has been using chlorine gas bombs to attack civilians. Logic would suggest that the opposition has a motive for this while the government does not. Some widely publicized writers, such as Dr. Annie Sparrow, are full of moralistic condemnations but curiously short of facts. As reported by Time magazine in Spring 2013, the major chlorine producing factory in Syria (and its stockpiles of chlorine) were under Nusra (Al Queda) control since 2012. It is also curious there are no current videos showing the alleged onslaught of chlorine filled barrel bombs while there are many videos showing the armed opposition launching gas canisters. At this point the documentary does something very misleading: it presents the expansion of ISIS and Nusra as a consequence of the Obama decision not to attack Syria. At 36:25 the documentary intones “Extremists exploited the decision not to attack.” At 36:35 Shahbandar claims that extremists are telling Syrian civilians “Look you’ve been betrayed by the world ….”. At 36:55 Baker (NY Times) suggests that ISIS and Nusra are saying “We’re the only ones who can take down Assad and create a new order here.” The documentary then claims that moderate rebels are joining extremists with ISIS emerging as the strongest. That is soon followed by video showing ISIS surging through Iraq and seizing Mosul. In reality, the extremists (Nusra, ISIS, etc) were the major armed opposition force long before the August 2013 situation. That was confirmed in the August 2012 DIA report. Nor was the surge of ISIS into Iraq a consequence of the Obama decision. The ISIS seizure of Mosul occurred in June of 2014, ten months after the Obama decision. 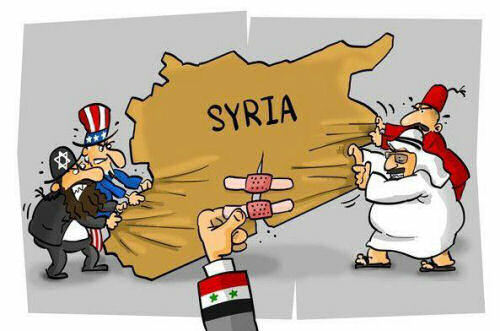 If the US had proceeded and attacked Syria in September 2013 it would have further weakened the Syrian government and helped the extremists expand even more. After four years of attacks by tens of thousands of heavily armed insurgents from all over the globe, the Syrian government and military is greatly weakened. That has allowed ISIS to control the lightly populated eastern part of the country. The Syrian army is bogged down fighting thousands of extremists in the major urban areas in the west, north and south which has allowed ISIS to continue in the east. I think it’s human nature to seek help from those who will defend you against the external threat that’s killing you, arresting you, torturing you … It’s no surprise that Syrians seek support of anyone to get rid of the regime that’s inflicting the pain. Ford’s assertion that the extremists are “defending” Syrians against an “external threat” is bizarre since the “external threat” refers to the Syrian government and “those who will defend you” refers to extremist organizations consisting of huge numbers of sectarian fanatics and mercenaries from across the globe. While there are some Syrians who want a sectarian wahabi state with strict sharia law, they are vastly outnumbered by Syrians who want to maintain a secular state and inclusive multi-faith society. The suggestion in this documentary that a significant number of Syrians seek “help” from ISIS or Nusra is a grotesque falsehood. Dropping bombs is not going to destroy the Islamic State and so it seems the Islamic State is going to maintain control over the eastern half of Syria more or less indefinitely. * “Obama at War” presents a biased and distorted view of the reality in Syria. * The experience and perspective of the vast majority of Syrians is ignored. * There is a pressing need for realistic reports which convey the perspectives and experiences of all people in the conflict, not just the “opposition” and their supporters. Rick Sterling is active with the Syria Solidarity Movement and Mt Diablo Peace and Justice Center. He can be emailed at: rsterling1@gmail.com. Read other articles by Rick.